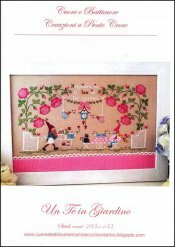 Un Te In Giardino [H1450] - $13.44 : Yarn Tree, Your wholesale source for cross stitch supplies. Cross stitch pattern by Cuore e Batticuore. Who doesn't love to enjoy a warm cup of tea in a beautiful tea garden?! "Happiness is....a tea in the garden," is stitched at the top of this design. A girl is enjoying a warm cup of tea with her furry friend. The waiter is bringing them a few pastries to enjoy with their cups of tea. Big, beautiful, pink flowers are blooming in the garden. Look closely by the coo-coo clock & you will see two birds singing out of the tea cups. Stitch count 285 x 155. Stitched on #3643 Zweigart Edinburgh Linen Light Mocha 36ct.